Steve Curren serves as Director of the Division of Resilience within the HHS Office of the Assistant Secretary for Preparedness and Response. His Division works to sustain essential functions of the Nation’s healthcare and public health system by collaborating with government and private sector partners to prepare for and overcome disruptions together. Since his arrival at HHS in 2008, Steve has focused on a wide range of critical infrastructure matters affecting the healthcare and public health sector, including cybersecurity, physical security, supply chain continuity, and all-hazards preparedness. He served as lead for the Department in the development and implementation of policies such as Presidential Policy Directive 21 (PPD-21) on Critical Infrastructure Security and Resilience, Executive Order 13636 on Improving Critical Infrastructure Cybersecurity, and Presidential Policy Directive 41 on Cyber Incident Coordination. 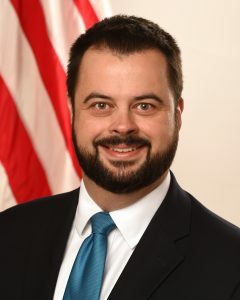 He has also led the Department’s establishment and support of the Health Care Industry Cybersecurity Task Force as called for in the Cybersecurity Act of 2015. In all of these efforts, he has focused on partnership, information sharing, and collaboration among public and private sector entities to advance shared security and resilience goals. Prior to joining ASPR, Steve worked five years at the Association of State and Territorial Health Officials (ASTHO), where he served as Senior Director for Public Health Preparedness. At ASTHO he directed a program to develop and disseminate model policies and practices to advance public health preparedness for State and Territorial public health agencies. Steve began his career as an industry consultant on public health and regulatory policy issues, with a focus on U.S. and European regulatory affairs. He holds a Bachelor of Science degree in Biology from Wake Forest University and Master of Science in Foreign Service (MSFS) degree from Georgetown University with Honors in International Business Diplomacy. He has completed executive leadership development through Harvard University’s National Preparedness Leadership Initiative, the Foreign Service Institute’s National Security Executive Leadership Seminar, and the Federal Executive Institute’s Leadership for a Democratic Society program.